The Ambraser Hofjagdspiel, c.1440/45, is attributed to Konrad Witz and his workshop in Basle. It was found in a collection at the castle of Ambras (Innsbruck, Austria) in the 16th century, hence its name The Court Hunting pack of Ambras. The pack originally consisted of fifty-six cards in four suits, and the suit symbols are lures, herons, hounds & falcons... which all relate to the theme of heron hunting. The thematic consistency in the pack is remarkable and must rank as the culmination of iconographic treatment of the hunting theme in playing cards. Right: detail from the Ober of Falcons. 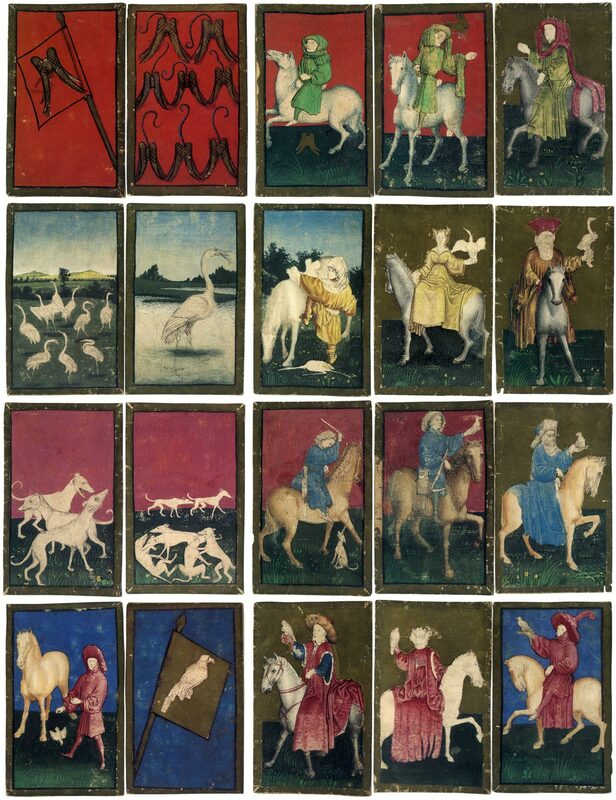 Above: cards from the facsimile edition published by Piatnik, Vienna, 1995, the original of which is in the Vienna Museum of Art History. The pack originally consisted of fifty-six cards in four suits, size 9.5 x 15.6 cm, painted red on the reverse. The cards are executed in water colours and paints over black ink drawings on paper - they are not printed or mechanically produced in any way. Several layers of paper have been glued together to give the cards the necessary thickness. As was the practice with early Italian cards, the back paper has been cut slightly larger allowing the edges to fold over to the front, forming a border around the fronts of the cards (sometimes this border obscures part of the drawings). The suit symbols are hounds, herons, lures & falcons. The court hierarchy consists of four court cards in each suit, unnumbered and without titles, all mounted on horseback: King and Queen (with brushed gold backgrounds), Upper Knave & Lower Knave (with backgrounds matching their respective number cards). The number cards are also unnumbered, but run from 1 - 9, with a banner as 10. Banner 10s were often associated with South German cards in the fifteenth and sixteenth centuries, and still are found today in Switzerland. See also: The Pack of Cards by the South German Engraver. The cards are notable for their carefully devised colour scheme and the consistent internal structure of the pack which extends to the clothing as well as background colours of each suit. Another feature is the thematic consistency of the four suits which all relate to the theme of hunting, a pastime which was the prerogative of the nobility for whom the pack was probably designed. Not all the numeral cards are arranged in neat, formal rows, but in some cases the artist has illustrated the animals' natural behaviour and arranged them in a haphazard, informal manner. These considerations, added to the cost of a luxury pack produced in the workshop of Konrad Witz, suggest that these cards were intended for courtly patrons, not for ordinary people. Furthermore, the cards can hardly have been used for play: they show no sign of wear and are unfinished... perhaps because the Herons and Hounds suit number cards were poorly suited to the practical requirements of card playing. A 56 card pack, of course, is similar to Italian Tarocchi packs without the 22 trump cards. Four court cards are found also in other early packs, such as the two packs by the Master E.S., but most packs had only three court cards per suit. In this pack, however, the Kings and Queens do not wear crowns but instead wear exotic headgear. In the years before the Renaissance reached the North, German bourgeois art began to embrace the external physical world: human figures and animals are depicted in these playing cards with realistic skies and landscape backgrounds, shadows and light-and-shade effects. 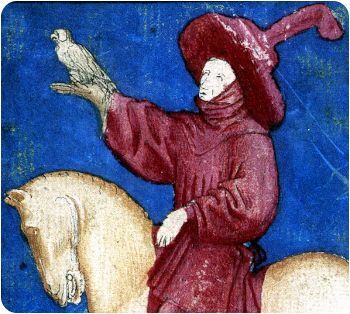 In several ways these cards depart from the typical conventions of fifteenth century playing card design and we may regard Konrad Witz and his apprentices as innovators in their field. See also the hand-painted "Stuttgart Cards" and copper-engraved cards by the Master of the Playing Cards and Master of the Banderoles.